What is Amana Capital "Introducing Broker" Relation? 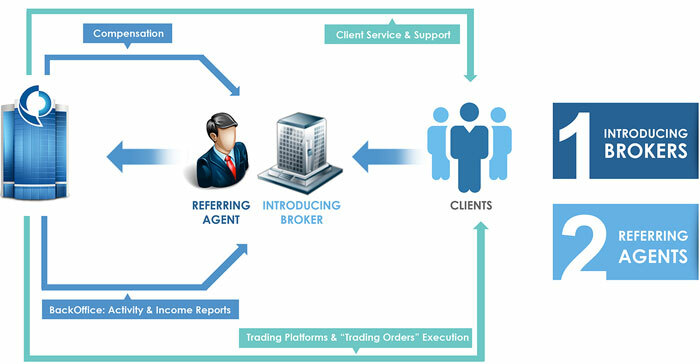 An “Introducing Broker” is an agent (corporation or individual) that establishes direct relationships with clients while introducing their business and delegating their accounts administrative work to the licensed & regulated Amana Capital which will be holding clients funds and will be responsible of their trades execution while the “Introducing Broker” focuses on growing his business. Amana Capital works closely with its “Introducing Broker” partners to provide them with superior incentives and unparalleled success opportunities. The company’s “Introducing Broker” partnership program offers full support to corporations, individuals and traders of all experience levels in developing their own trading business. Amana Capital highly values “Introducing Broker” partners and their business. That is why we dedicated specialized administrative resources to ensure that you are always compensated on time and in full. Amana Capital strives hard to undertake all required and possible action to facilitate a prosperous business relationship with you. Amana Capital works closely with established “Introducing Brokers” to offer them unmatched incentives. Active IBs may benefit from around-the-clock premium support in addition to advanced assistance to facilitate their work. Amana Capital always appreciates its partners’ business! That is why you can benefit from Amana Capital tailored tools, customized trading software, sales assistance programs, marketing opportunities and much more. Who Can Benefit from Amana Capital Introducing Broker Program? If you are a Brokerage firm, a money manager, a financial education school, a financial analyst, a social media pages/groups manager, or an online communities/forums manager, than this Introducing Broker Program is definitely for you.